Changing trends of tattooing in India: It’s more customised now, but do you know the 3W formula? From the tribes of India, to pop culture, and now as symbolism for personal life-stories, tattooing and tattoos in India have come a long way. What do Udta Punjab rockstar Shahid Kapoor and southern belle Taapsee Paanu have in common? Both, and many others in the music and entertainment industries, have inspired scores of people to get inked. Though these guys have both gotten temporarily inked to play their characters — while Kapoor looks great with a massive winged tattoo, Paanu flaunts a pretty musical tattoo of a beautiful woman on her back — for the rest of us, tattoos signify a sense of permanence. More so, it’s about telling your life-story or capturing a particular moment in a piece of art that will always remain with you. While Shahid Kapoor (L) looks great with a massive winged tattoo, Taapsee Paanu flaunts a pretty musical tattoo of a beautiful woman on her back. 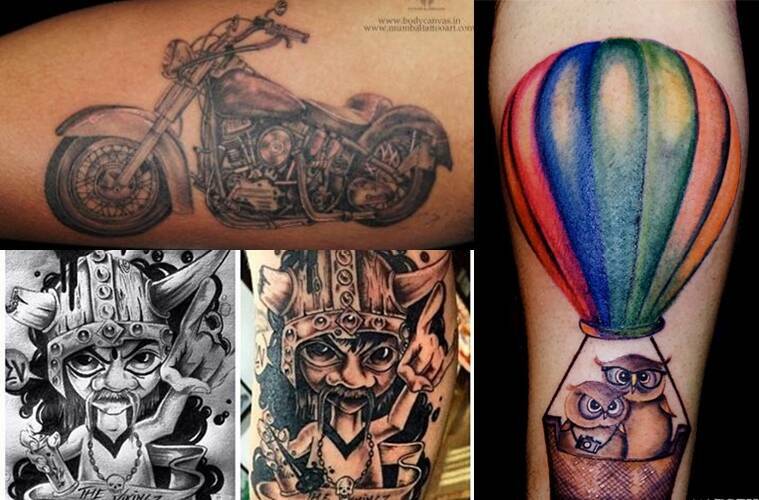 “What is really a trend lately is customising the tattoo as per the client’s request. The client has a story that he wants to tell by getting tattooed and we give that story characters as it has to be very special and close to the client’s heart,” says Vikas Malani, who co-founded BodyCanvas, along with Micky Malani. According to the duo, previously, there was a huge demand for tattoos like dragons and butterflies, then in the last two to three years geometric tattoos and realistic tattoos like monuments and animals picked up in demand, but the brothers are particularly upbeat about how inclusion of personal stories in body art has seeped into popular culture. This indicates a dilution in the stigma that is usually associated with tattooing. If people are extending their life and personas to the designs being inked on them, it also shows a deeper sense of understanding of the art form, but there is still a long way to go. “As an artist and a lover of this industry and someone who has seen this industry rising up from the ashes, there is a great need for conventions focused on educating the new and upcoming artist,” says Vikas. India hosted the first-ever tattoo convention, called Heartwork Tattoo Festival in December 2015 where 60 tattoo artists from across the world participated in the three-day-long festival. But, as surprising as it sounds, this country’s connection with tattooing has little to do with popular culture. For aeons, we have had the tradition of permanent tattoos called godna, specifically in the Awadh region, which usually means tattooing names or religious symbols on oneself. Prior to the 1980s, there is evidence of tattoo art called pachakutharathu in south India, especially Tamil Nadu, where it was used as cultural symbols. 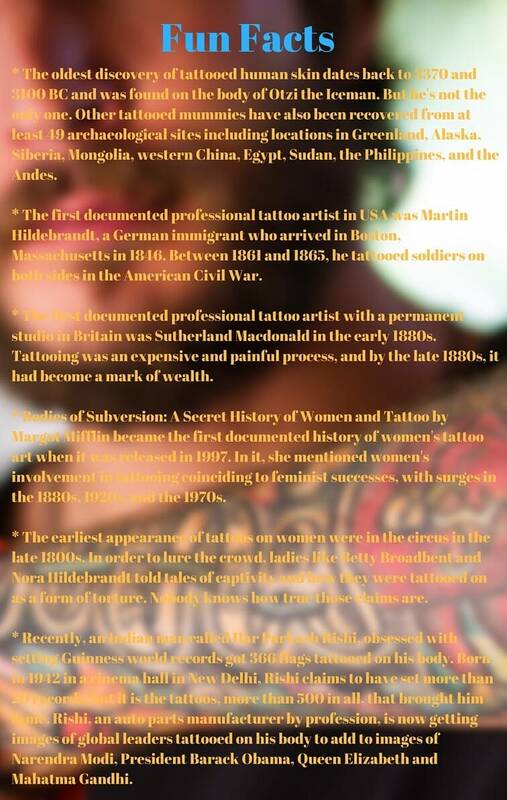 Interestingly, tattoos as a mark of rebellion has a deeper historical connection as well. How many of you know of the tattooed rebels of Chhattisgarh, called the Ramnamis, who used to fight caste oppression with full-bodied ‘Ram Ram’ tattoos? This sense of responsibility is what needs to be inculcated among new enthusiasts, and it’s all in the 3W formula: What you get done, who you get it done from, and where you get it done from. * Before anything else, select a proper tattoo artist. Check his/her reviews and artworks and arrange for a consultation. Second, check the hygiene of the artist as well as the studio. Most importantly, give yourself enough space and time before getting inked. * But things don’t end here. Getting a tattoo is an amazing feeling but maintaining it is difficult as even slight negligence and carelessness can wreck an intriguing piece of body art and turn into a disaster. The most important thing that you need to remember is that once the tattoo is complete, resist the temptation to open the plastic wrapped around your tattoo and never touch it with dirty hands. * Once you remove the cling wrap (after keeping it intact for a minimum of 2 hours), wash your tattoo gently with the help of your hands with a mild, fragrance and alcohol-free soap. Do not use a loofah to remove excess blood, ointment and ink. * Pat dry only using a tissue towel. Do not rub it. Then, apply a super thin layer of Nivea cream. Your tattoo should be visible and the extra cream should be wiped off gently. Repeat the process three to four times a day. * Avoid the gym for one week and swimming for two weeks. * Never touch your new tattoo with dirty hands or fingernails. Also, do not wear tight fitting clothes. * Try not to expose your tattoo to direct sunlight for two weeks. After the healing process is over you can wear a sun-block. Changing trends of tattooing in India: It's more customised now, but do you know the 3W formula?